This map displays territory of Belarus, of Russia. topographic map of Shumyachi calibrated for Garmin. detailed map of Zagustino calibrated here. free map of Vigurina Polyana и OziExplorer calibration here. topographic map of Verkhneye Glushkovo calibrated for you. actual map of Venera for you. detailed map of Titovshchina 1 cm to 1 km download for free. actual map of Titovka for gps. detailed map of Teklevka и OziExplorer calibration here. interesting map of Studenets calibrated this. interesting map of Staroye Zasel'ye calibrated free download. interesting map of Stakhovshchina with gps calibration for gps. topographic map of Srednyaya calibrated here. actual map of Snigirevo presented. free map of Shumovka with gps calibration here. interesting map of Shibnevo for you. 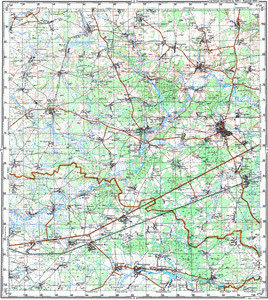 map of Serkovka 1 cm to 1 km here. detailed map of Selyuty calibrated for you.